Amara, aka the Darkness, is definitely the most powerful Bad guy on this list. God is the only one who can match her in power, but is unable to defeat her without help. The darkness’ form was revealed in season 10. When Delving in to the history of the Mark of Cain we learn that it is actually a key. According to Amara, God conspired to seal her away, and she implied it was her trust in Lucifer that led to her downfall. God gave the Mark to Lucifer, his favorite angel to guard. The Mark, however, exerts its own will (sound like LoTR anyone? My precious….) and revealed itself to be a curse. It corrupted Lucifer, leading to Lucifer refusing to bow down before humanity and be cast out of Heaven. Lucifer passed it to Cain who passed it to Dean. 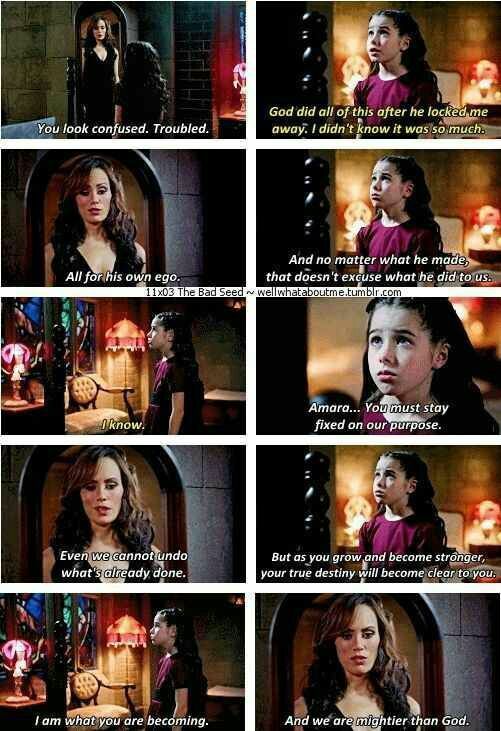 Amara technically is not good or evil. She is a powerful, amoral, and horribly destructive force. God would create worlds and worlds to show Amara it could be more than just them and she would tear them apart. Amara goes out of her way actually not to harm Dean and protects Dean over the course of the season. She is kind of like a baby duck imprinting on the first human she connected with, even if it was via the mark. We find out that God and the archangels had waged war against Amara and locked her away after God created mankind. God revealed that he chose not to kill her in her weakened state as she needed to exist with himself so reality wouldn’t be destroyed. Outside of Metatron and Death everyone assumed the Darkness was a myth. When Amara is freed, she rolls up in a destructive way that infects the town the Winchesters were in. It was so strong it damaged Lucifer’s cage in hell, that allowed him to send Sam visions. So Amara appears on the show as a baby, who eats human souls. Amara is consuming souls causing her to age rapidly. She has infected the town and turned the people into what Sam calls “Rabids” – it’s kind of like the Croatoan virus Lucifer creates but you retain intelligence. Sam cures the Rabids by burning the infection out with Holy Fire. Which makes sense as holy fire comes from God, so the 2 of them balance out. So at this point she is taken by Crowley as a child who attempting to seduce her to his side by taking care of her. She attempts to learn about humanity via the internet, but doesn’t understand humanity or why God values it. Eventually she starts plotting with her older self in a mirror and that’s when she spins out of Crowley’s control. This is a hint towards her overall motivation as we can see she has a beef with God. Everything right now has the vengeance against God as the driving force. She slips hell’s control and is out roaming the earth consuming souls and leaving soulless killers in her wake. Crowley attempts to kill Dean, but Amara steps in and saves Dean. Beginning from this point we discovered she was God’s sister (episode 6, “Our Little World”), and especially once she became an adult (episode 9, “O Brother, Where Art Thou?”), her destructive motivation was revealed. Amara desires revenge on God first and foremost. She yearns for love (since her brother abandoned and deceived her) and places her belief in Dean for this acceptance. Her efforts are focused right now on trying to draw God out by killing humanity, and getting Dean to become one with her. He doesn’t want anything to do with her however, so she becomes increasingly despondent. Her brother will not even acknowledge her presence and Dean, mortal though he is, tries to kill her. This is such a pivotal episode. Not only does Dean turn on her, it’s the first time we really see someone try to blow her to kingdom come. She saves Dean again though when Heaven bands together to try and take her out with a celestial blast. She teleports Dean to safety before meeting the blast head on. Cas and an angel Ambriel are hunting the blast site and find her unconscious. She awakens and consumes Ambriel’s grace. She tells Castiel: “I mean, Heaven brought the thunder, and it barely even scratched my paint job, but you and a shiny knife?” The blast had weakened her though, and Rowena helps her recharge. Focusing on her interaction with Rowena in “Hell’s Angel,” Rowena is feeding her desire for revenge. Her desire to be part of a family is overshadowed by her inability to connect. We can see again her yearning for love and acceptance if you catch her look at Dean when she comes to steal Lucifer/Cas. She steals Lucifer/Cas as a ploy to try and draw God out. She is counting on him being the one thing God may still care about. Episode 20 Don’t call Me Shurely, which was an amazing episode, Amara has again released her poison fog. This fog infects everyone but herself and Dean turning them into Rabids. They try to hide the uninfected in the police station which fails and Sam becomes infected. Dean demands God’s help at this point, and what do you know he finally makes his appearance. In the vessel of long forgotten Chuck Shurley. Another surprise Dean’s amulet makes its return appearing in Dean’s pocket. For those of you who have yet to see it, you should watch Rob Benedict singing fare thee well in this episode, it was beautiful. Jumping ahead to episode 21 All in the Family, Amara is aware God is back and in play. She tries to entice Dean into helping her lure God by showing him how trashed Cas is. They use Dean meeting with her as a distraction to try and spring Lucifer. 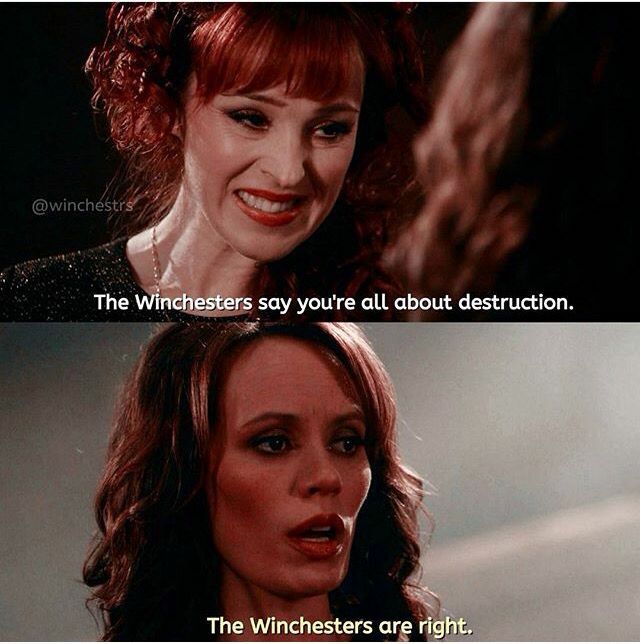 When Dean uses her feelings to simultaneously trick and reject her, and God still refuses to speak to her, she snaps. Scorned, rejected, and alone – she’s discovered both Rowena and Crowley working against her as well – she goes on the warpath. But this anger is motivated by a hurt and broken heart. She ends up killing Metatron who stayed behind to give Sam a chance to escape with Lucifer. In the episode We Happy Few she finally confronts her brother. At this point, she is furious. She’s been jailed, beaten, rejected, and then he once again tries to lock her up behind the Mark. In the heat of this battle and the complex emotions, emotions she has no means to deal with, she tries to kill Him back. In the finale of the season, The Alpha and Omega, we see her struggling with the choice she made. The one person she truly cared about in her entire existence was dying. And it was her fault. All the rejection she’d experienced she turned around and blasted at Him. And it hurt far worse than she could have imagined. But then she meets someone who does have a frame of reference and wisdom to share. And finally after the whole season, she’s ready to listen to what Dean has to say. After convincing her to let go of her hate she is able to confront her brother. She heals God, but before they leave she gifts Dean with the return of his family since he helped save hers. So Amara, from Scary God monster the Darkness to loving sister her arc is the most satisfying supernatural has ever created. ← Rip Hunter Back on Legends of Tomorrow? ?